When thinking about perpetrators of child sexual abuse, many people picture an image of a creepy stranger. Parents and schools generally do a pretty good job of teaching their kids about “stranger danger.” But this is not where most of the danger lies. The vast majority of sexual abusers are known to the children they target, so it is incumbent upon us to teach kids not only how to respond when an uncomfortable or dangerous situation arises, but also how to recognize when danger is approaching. We want our kids to be aware that they need to be careful with everyone, even people that they care about, but don’t want them to be so unduly frightened or anxious about the possibility of being hurt that they avoid developing trusting relationships with safe adults. It’s a fine line, and one that makes teaching about grooming a somewhat daunting task. And there aren’t a lot of easily accessible resources out there to help us how to do so! 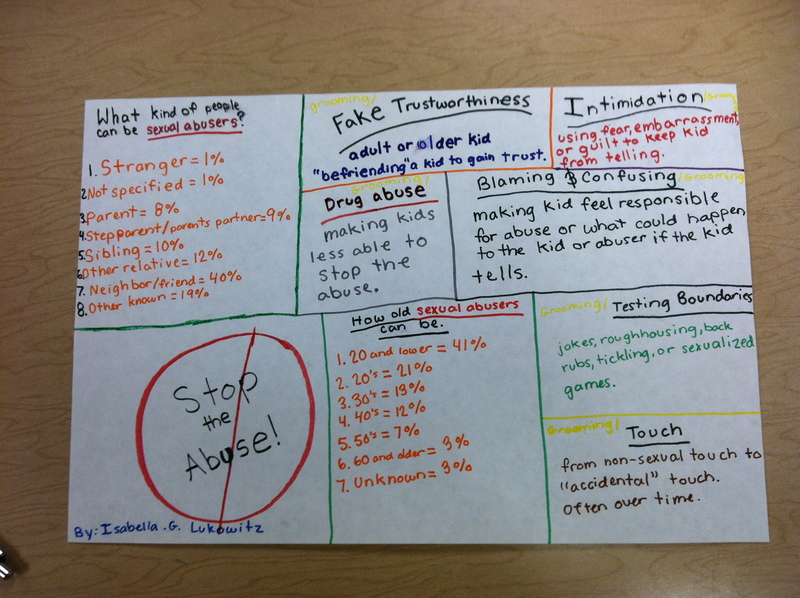 For me, figuring out the best way to teach about this has been an evolving process, and I’m sure I’ll continue to improve and expand upon my lessons (and I’ll keep sharing when I do), but here are some strategies and information that I currently use to teach kids about sexual abuse grooming. I use these lessons in the classrooms and also, when appropriate, with individual students. Define Grooming. I explain that often when people are talking about grooming they mean “cleaning up,” like combing your hair, washing your face, or making sure that your clothing is on correctly. We talk about how grooming also means “getting ready” – you would get ready for having your school picture taken by making sure that your hair, face, and clothes were all set. In the same way, sexual abusers groom kids they want to abuse by getting them ready to abuse. Groomers Choose Their Targets Carefully. 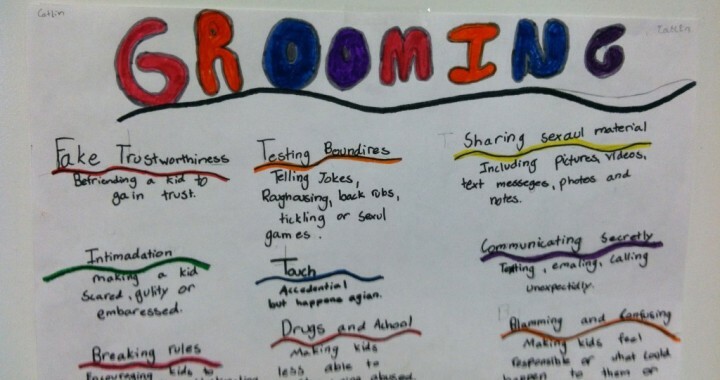 Groomers don’t want to caught, so they target kids who they think won’t tell or say no. They try to pick kids that they will someday get a chance to spend time alone with. Grooming Takes Time. Abusers do not just walk up to kids and say, “I want to touch your private parts” because they know the kid will probably say “No!” They want to abuse kids, but they don’t want to scare the kid away too soon, and they don’t want to get caught, so they build invisible “traps,” kind of like spider webs, in the hope that the kid won’t notice until they’ve already been caught. Lots of kids have good background knowledge of prey animals from watching animal shows on TV. I often ask if they can think of an animal who sets up traps. 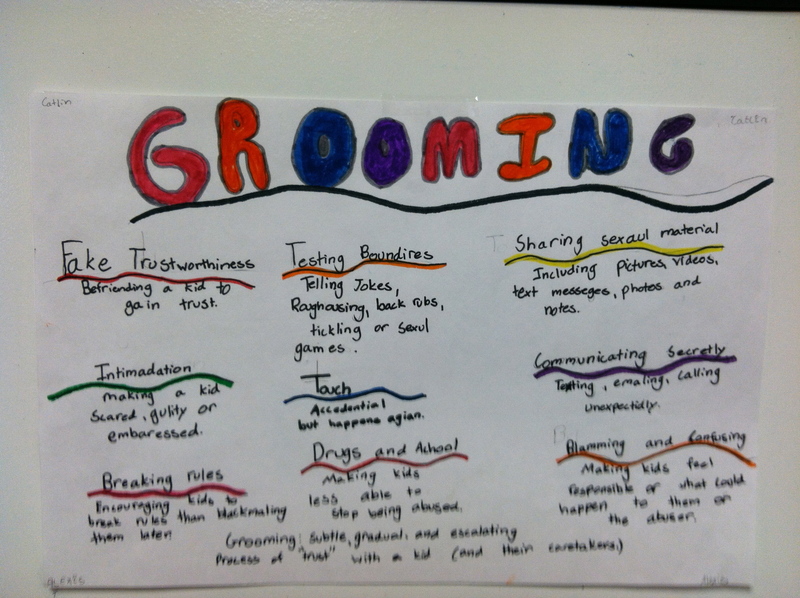 This help them make connections that help build their understanding about grooming. For all of these tricks I give examples of what an abuser might say or do at different stages in the grooming process, pointing out how it might be hard to recognize at first, the gradual pace, and how it escalates over time. Although I try to build in the concepts of “tricking,” secrets, and using sexual material to harness kids’ natural curiosity at all grade levels, I specifically taught the above material with this exact language to fifth graders last year. It went so well that I am going to use it with fourth graders this year, although I may adapt it a bit. I will update you about how it goes. 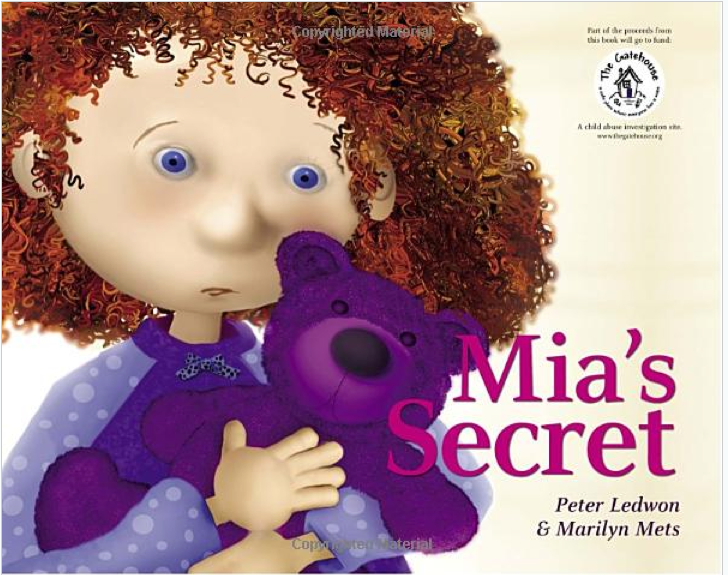 A great resource for teaching kids of all ages about grooming is Mia’s Secret by Peter Ledwon and Marilyn Mets. Mia is a young girl who is groomed by her mom’s friend, who plays with her and gives her a board game as a gift. (if you look carefully at the illustration you will see the game is called “Snake Pit.”) After a while he asks her to play another kind of game with him – the abuse – and then during subsequent events when she tries to resist, he uses the groomer’s tricks of cajoling by saying things like “But I played your game . . . I thought we were friends,” making her promise to keep the game a secret, and finally threatening her. The abuse stops when Mia figures out that she can get around her promise not to tell by telling her stuffed bear, Tikki, who then “tells” her mom. Mia’s Secret is a wonderful, must-have book. It covers the importance of telling when there are secrets about touching or you are hurt, how to tell even if you can’t find the words or have promised not to, and is the best picture book I have ever seen that addresses grooming so clearly and so well. It is truly a book you can read with kids every year, because the content is deep and rich, and they will discover something new each time. 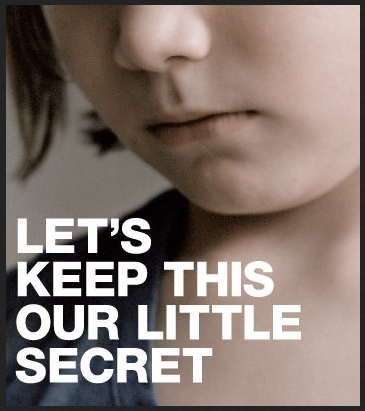 I use it in third grade to very directly discuss grooming, and it’s a great review for them about secrets and how to tell. After teaching lessons on grooming, I have had kids tell me things like, “That is exactly how it happened!” or “He said _________ and gave me __________.” They always say this with strong voices with a tone that indicates they are outraged by the injustice. Their feelings of empowerment seem to outweigh their feelings of shame and powerlessness. So here’s another important reason to teach about grooming: Not only can it help prevent or stop sexual abuse, it can also help kids who have been sexually abused feel less responsible for what happened to them! For more information about grooming (also good to share with parents) check out Child Sexual Abuse: 6 Stages of Grooming by Dr. Michael Weiner. More in this series about sexual abuse prevention coming soon. I hope you’ll let me know what you do to help kids learn about sexual abuse prevention and grooming.